GN Solid Controls is committed to the design, development and manufacturing of high-performance industrial decanters. Horizontal spiral unloading sedimentation centrifuges have been widely used in various fields since the 19th century based on the same theory of centrifugal sedimentation. GN Solid Control can manufacture centrifuges with drum diameters as small as 220mm (9 inches) up to 760mm (30 inches), with an aspect ratio of up to 4.2 and a separation factor of up to 3000G. It is a professional manufacturer of decanters in the industry that has both the API certification for oil drilling industry and the EU export CE certification. 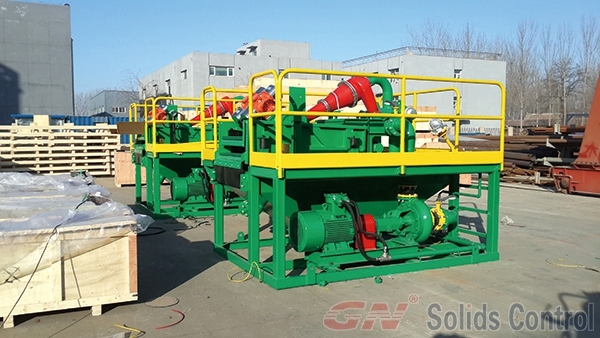 GN solid-controlled tunnel shield slurry slurry processing system is mainly composed of GNLW764A-VFD horizontal screw centrifuge and GNLR-10000S flocculation dosing system, GNGH-15C automatic curing system. It is characterized by strong waste disposal capacity, high efficiency, 24-hour continuous operation, and high automation. A complete system can realize remote operation or complete operation of one operator, low maintenance cost, compact footprint, and convenient module for transport lifting. The design eliminates manual disassembly and other aspects. The working process of the whole system is as follows: Start the GNLW764A-VFD centrifuge module first, and after the centrifuge runs smoothly, start the liquid supply screw pump for the centrifuge, open the screw pump into the slurry valve, and extract the slurry from the customer storage tank to be treated. In this process, the dosing screw pump in the GNLR-10000S flocculation dosing system is started at the same time. There are two sets of drug supply pump lines, which can be directly supplied to the centrifuge inlet or supplied to the screw pump according to the effect of the centrifuge treatment. The slurry inlet is treated with flocculation to increase the centrifuge throughput and treatment efficiency. The solid phase processed by the centrifuge is discharged into the customer collection tank through the sand pit of the centrifuge. The dry slag is transported to the GNGH-15C automatic curing system through the conveying screw at the bottom of the collection tank for further drying treatment. The discharge can be processed below 20%. Solid dry residue with moisture content. The liquid that has been treated by the centrifuge reaches the customer’s requirements and the clean mud goes through the customer’s manifold and enters the wellhead or into the customer’s storage tank. This process is repeated to achieve the reuse of drilling fluid, or directly discharged into the municipal sewage pipe network for direct discharge. In order to achieve energy-saving emission reduction and environmental protection purposes.